Chevron Glass has introduced another outstanding Low E product, LoĒ-i89® manufactured by Cardinal Glass in the USA. LoĒ-i89® on clear is an energy saving Low E glass and incorporates Neat® self cleaning technology. LoĒ-i89® is a high performance glass, clear in appearance with high light transmission. An important feature of LoĒ-i89® is a clearer surface without the haze of other Low E products. LoĒ-i89® is suitable for residential and commercial applications. LoĒ-i89® can be single glazed and is supplied as a toughened product. When single glazed, surface #1 (external) has the Neat® self cleaning coating and surface #2 (internal) is a smooth Low E coating which allows easy cleaning and removal of any label residue. When incorporated into a Chevron insulated glass unit, LoĒ-i89® can be combined with a variety of other glass products to achieve outstanding energy rating performance with exceptionally low U values. 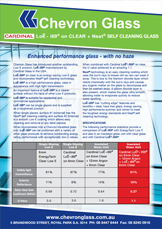 When combined with Cardinal LoĒ3-366® on clear, the U value achieved is an amazing 1.1 . Neat® technology is an easy cleaning coating which uses the sun’s rays to loosen dirt so rain can wash it away. This is due to the titanium dioxide layer which reacts chemically with the sun’s rays and causes any organic matter on the glass to decompose and then be washed away. A silicon dioxide layer is also present, which makes the glass ultra smooth, allowing water to evaporate quickly to reduce water spotting. LoĒ-i89® has “cutting edge” features and benefits – clear, haze free glass, energy saving, high performance summer and winter to meet the toughest energy standards and Neat® self cleaning technology. The following performance statistics provide a comparison of LoĒ-i89® with EnergyTech Low E and also in an insulated glass unit with clear glass and with Cardinal LoĒ3-366®.